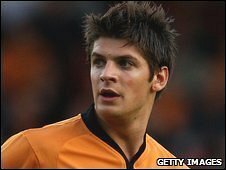 Exeter City have signed Wolverhampton Wanderers defender George Friend on loan until the end of the season. Friend began his career at St James Park, making 37 appearances for the club before signing for Wolves in 2008. The 22-year-old has played eight games for the Molineux outfit but has spent most of this season on loan at Scunthorpe, Southend and Millwall. The full-back will go straight into the squad for Saturday's League One clash with Oldham.